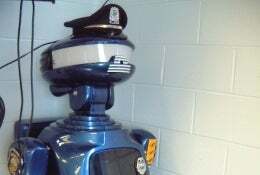 Machines could take over many crime-fighting tasks from the police by 2040, a leading British robotics expert has said. Professor Noel Sharkey believes that by 2084 advanced robots will have human-like features and will be able to detect weapons as well as recognising drunks and aggressive behaviour in large areas... The report also predicts autonomous police cars will appear by 2070 which will be able to recognise speeding cars, identify licence plates and automatically deduct fines from bank accounts at the same time as adding points on driving licences.